I’ve done it. I’ve made the best recipe for Quinoa ever. The stuffing is so good that I’ve eaten about half a cup plain. This is a recipe with many parts so it will take some time to complete and look forward to a messy kitchen. I got the idea for acorn squash from Food Wishes— but I’m not a huge fan of sweets (I know right?) so I wanted to add some sort of stuffing that balances the caramelized sweetness from the glaze. I think the combination of sweet and savory really did it. A lot of people have never heard of quinoa and I don’t blame them– it’s not readily stocked in supermarkets so if you have a specialty store near you, definitely give it a try. Quinoa is a seed of the Quecha (idk) plant much like how rice is the seed of a rice..plant? Anyways, I like to say that it’s the couscous of the grain/seed group– but I don’t particularly like couscous as much as I like quinoa. 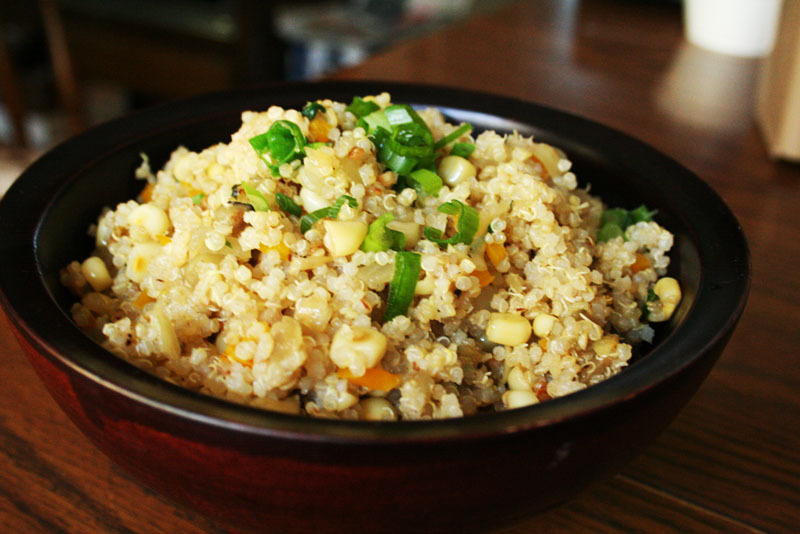 Quinoa has that slight “crunch” like brown rice has a slight bite– a completely different texture than couscous (which is a pasta). It’s also extraordinarily good for you (and gluten-free as far as I know). You know how white rice essentially has no nutrition for you? Well quinoa has a good amount of the amino acids needed for humans therefore, a really high protein content (especially for a grain) making it a popular choice for vegans and vegetarians. Begin prepping your quinoa ingredients– chopping everything up. Then, bring the quinoa and liquid to a boil in a small pot, cover and bring down to a simmer. Simmer until quinoa has “blossomed” and white rings are visible and is fluffy. ( I burned the bottom a little but it was still good). When it is done, fluff it with a fork and add some apple juice for fragrance. While the quinoa is cooking, preheat the oven to 400F. 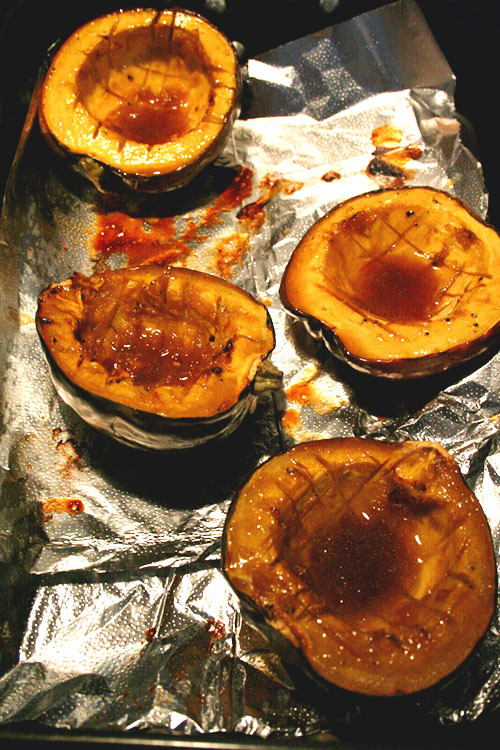 Cut the acorn squash in half– be careful, I nearly gutted my stomach like, twice. Clear out the seeds with a spoon or your hands and cut criss-cut slashes through the flesh. Brush each with some apple juice. Place skin side up and bake for 20 – 30 minutes. While baking, make the glaze. Cook the maple syrup, butter, and brown sugar into a small skillet– it will boil and froth, keep stirring for a few minutes until it’s syrupy, season with pepper. Remove the squash and divide the glaze among the halves, brushing the syrup into and around the slashes. Bake for 30 – 40 minutes until soft and glaze has reduced a bit, taking the squash out every 10 minutes to reglaze. Find time between this somehow (haha), and over medium-high heat, cook the onions, bell peppers, drained eggplant, and corn in a few tablespoons of olive oil. Cook until onions have softened considerably. Add garlic and saute until fragrant and cooked through. Add basil and saute. I usually don’t add any more salt because the eggplants are pretty salty. Mix the quinoa, vegetable mixture and green onions together, season to taste, and mound into the squash.